On May 9, Europe Day, I worked with Changemakers Lab, a Lesvos-based coworking hub, to launch its first co-lab initiative where refugees, students from the University of Aegean, mentors from social businesses, leaders from nongovernmental organizations, and heads of local government worked together to chart the path of creating social enterprises with the refugees so they can use their skills and ideas to thrive within the Greek community. Teams of refugees and students were formed and participated in a Lean Startup week using design-thinking processes. They were introduced to tools such as the business model canvas and business pitch templates to co-create solutions that would benefit the refugee communities using their combined skills and expertise. 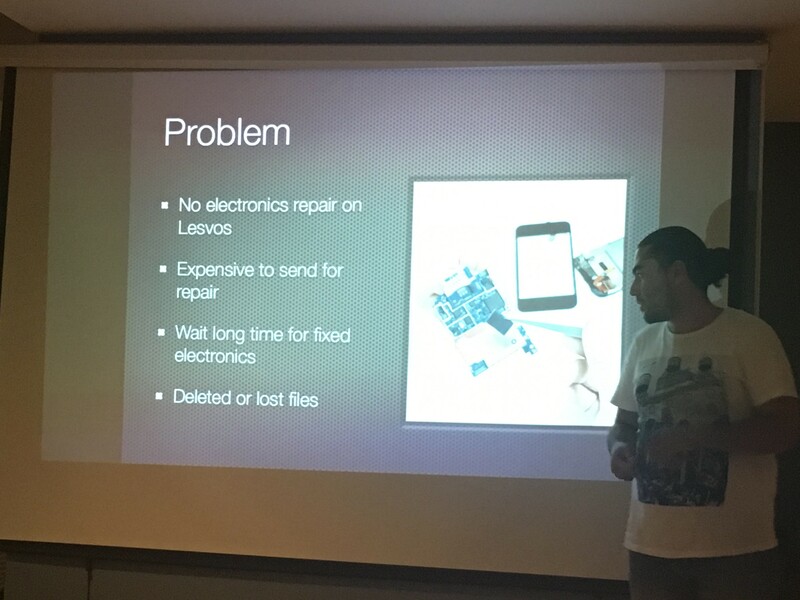 The teams came up with ideas such as mobile-phone repair service to be run by one of the refugees who used to fix phones in his country. One other idea was to set up a Syrian-themed restaurant and catering business to attract Greeks and tourists interested in a new cuisine while satisfying refugees’ cravings for home-cooked food. The refugee who came up with the idea used to run a catering business with his wife back home. Another idea was using technology to screen for health risks and obtain medical advice for refugees working with the ClickMedix platform, and local Greek medical specialists. At the end of the workshop, the teams pitched their ideas to mentors and leaders from local nongovernmental groups and potential funders. For most of the team members, it was the first time they had developed a social business pitch and implementation plan. Having facilitated many business innovation workshops, most of them without the participation of those affected by the problems of refugees, the co-lab experience incorporating the refugees, to solve refugee-related issues, was quite a demonstration of the importance of co-creating with the users of the envisioned solutions. From a design-thinking process perspective, involving those representing the target beneficiaries shortcuts the duration of problem-identifying phase and speeds up the solution-identification process significantly—what has been tried, what would work, what would not work with the target population. Another critical benefit of involving direct beneficiaries early on is to more easily and quickly identify pilot sites and the stakeholders involved. For example, to pilot the use of ClickMedix for health risk screening, we identified a local Greek medical specialist who has already been working with the refugee patients and was able to work with the camp volunteers to start setting up a pilot. Lastly and most importantly, those who co-created the idea would take ownership of the idea to take the idea from concept to a thriving business. Despite being the first Lean Startup for refugees in Greece and having successfully incorporated the refugees and the Greek community participants, funding sources remain uncertain. As with many business pitches, many of the stakeholders were interested in seeing how the ideas will evolve into actual implementations, the pathway to funding for the refugees’ ideas is unclear. 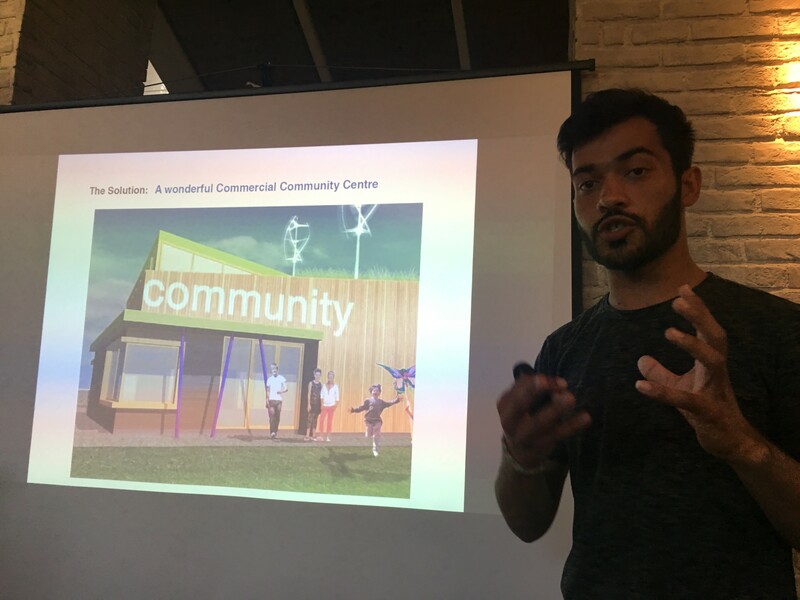 Changemakers Lab will be establishing co-working spaces to attract local refugees and entrepreneurs as well as international enterprises to the Island of Lesvos to co-create more high-impact solutions and continue to engage interested stakeholders and investors. Funding gaps: Oftentimes, funding for innovations tend to be just enough to validate the problem and the solution concept, and acquiring the next stage of funding to build and pilot solutions requires different skillsets and funding paths. How can we help build a toolset or playbook to turn concepts into actual implementations? Do such resources already exist that we can tailor to the refugee context? Economic Opportunities: How to turn “situations” into “opportunities”? Greek may have encountered a “refugee crisis”, but on the flip side, they have increased number of skilled workers. What can be done to empower the influx of migrant workforce into economic strengths? Resource Pooling: Various solutions already exist, such as coding schools, innovation workshops, business plan competitions, funding organizations, etc., and many of them are being used duplicatively, causing resource waste without an increase in impact. What can be done in a resource pooling or a market-space manner to better match existing solutions to current issues? You can read more about the incubation labs for refugees in this interview with the Founder of Changemakers Labs!